Yesterday I think the amazing words of Jen Shand made my family reflect on those long hot harvest when three brothers and their families worked tirelessly together to make a living on the land. The memories were priceless, and thank you for reminding us that the surf lifestyle qualities don't just sit with the lucky few living near the ocean. It's there for us all to enjoy. Surf lifestyle designer Maryla Johns grew up surrounded by a sea of barley and canola crops. Every summer after harvest her family piled into their car for the three-hour drive to Torquay for a different ocean view. They swapped the hum of the header for the sound of the surf and the black dirt of the Wimmera plains for the soft sand. And the pull of coastal living reeled her in. ``We were all tired and the seaside just worked its rejuvenating magic every year,'' Maryla says. homewares range from Surf Coast and Geelong region beaches. ``I've spent many a happy hour walking along the sand with my beloved Cavoodle and what we have here is just breathtaking, it's really special,'' Maryla says. The stylist's newly-launched creative design business, maryla surf lifestyle, reflects her love of that coastline and its natural beauty, with its crashing waves, twisted ti-tree and golden sand. The coast is the foundation for Maryla's art, photography and love of nature and it's reflected in her paintings and homeware range. ``Design for me is all about elevating the qualities of the surf lifestyle and focusing on the elements that help make our home a sanctuary,'' Maryla says. 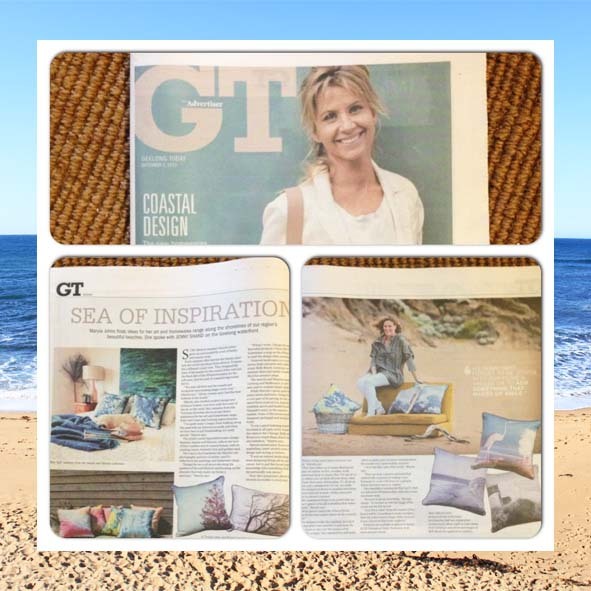 Seaweed landcapes cut a colourful swathe across large canvasses and designer cushions celebrating iconic Bells Beach, Geelong's Waterfront, summer skies and sandy coastlines are part of Maryla's product range. The maryla surf lifestyle range, all made in Geelong and Melbourne, is set to expand in the new year to include lamps, bedding and towels. While Maryla's career path has contained many twists and turns, design has always been a core part of its paving. In her early 20s she spent three years in Los Angeles, helping establish sports and healthfood company Musashi's entry in the massive American market. Some of the products she developed, designed, packaged and marketed still exist today. ``It was a great learning experience to be involved in all parts of the business, including the visits to the Chicago Bulls and the Denver Broncos to teach them about supplementation and nutrition,'' Maryla says. Maryla turned away from a successful marketing career several years ago to study design and styling in Sydney. ``It was an instant awakening,'' she says. Now she's passionate about making the surf lifestyle accessible to everyone. ``Homes today aren't just a roof over our heads,'' Maryla says. The designer is drawn to qualities that bring natural, textural, homely, restful and joyful tones to a home's essence. ``We sometimes forget to be joyful with our home's spaces or to add something that makes us smile,'' Maryla says. The designer walks the coastline, records the coastline with her artist's eye and tries to peel away its many layers to discover the essence of its magic. It's a magic that captured her and many others in dusty parts of inland Australia when the seaside was a mere holiday memory. ``I love the Rip Curl's of the world,'' Maryla says. She remembers wearing her Rip Curl t-shirt as a kid on hot Wimmera days when the ocean was hours away. ``Because it meant something, ''she says simply. ``It touched us with the magic of the ocean and we felt special. Products are available at @luxe by design, Pakington Street, Newtown, or at www.maryla.com.au.